One of the hardest tasks in esthetic dental surgery is healing the damaged gum. This is a long and challenging process. Why is it hard? Because the gum is a soft tissue and not always grows where we want it to grow. It was a very challenging task... The patient knew all the time what she wanted and it simplified the cooperation. After we removed the bridge we saw that the snag of the small incisor located amazingly high and the edge of the gum was too low on the front tooth. The gum is in line at the small and the big incisors!!! 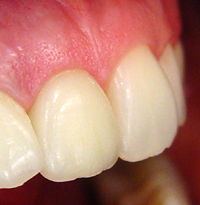 Although between the canine and the lateral incisor we could not fill the gap with gum. There is nice and healthy gum beside the teeth.